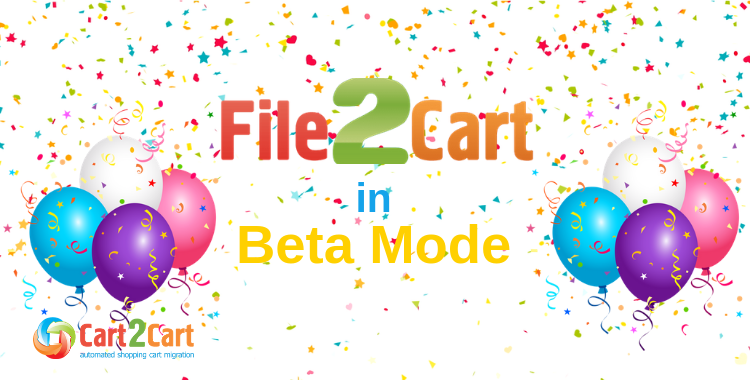 We are happy to announce the launch of File2Cart in Beta Mode! File2Cart is an online service that performs automated data import from .csv, .txt or .xml files to your shopping cart. From now on there will be no problems with import of products, categories, orders and other data from another shopping cart, a separate database or your wholesaler. File2Cart does the job! As Cart2Cart, it will surprise its users with the speed and accuracy of the whole procedure: the service imports data from the file to a store within several hours. One more considerable advantage of File2Cart service is that it allows to transfer your data from almost any shopping cart to any of those supported by File2Cart. Everything required from you is have a .csv, .txt or .xml file containing the data you want to move to your cart. File2Cart will import them to any of 34 major shopping carts it supports now. At the moment you can perform import of all the product information only, but soon the import of orders, customers and other data will be available. Try the new service out and make your own conclusions! Perform a Demo Import of 10 products for free and estimate the cost of your data import with the help of Data Import Estimator.